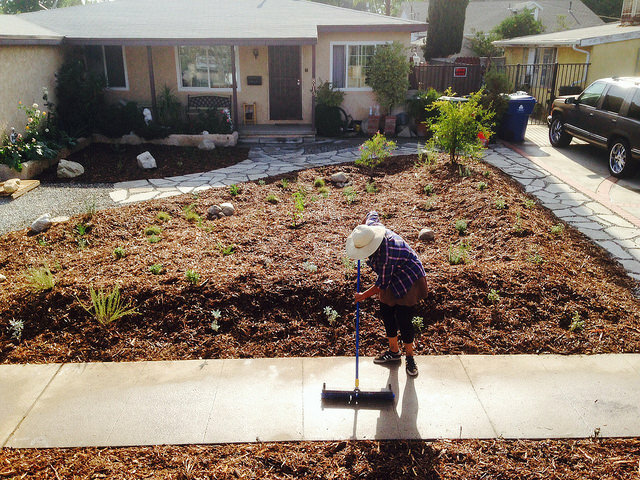 The Water LA program was developed to explore the possibilities of LA residents playing a substantial role in managing the region’s stormwater. Intended to maximize water capture, conservation, and reuse on individual properties, the pilot offered a model for how to design sustainable home landscapes that could, in aggregate, create a more climate-resilient Los Angeles. The County’s 1.68M single-family residential properties comprise a substantial portion of the region’s developed land area, representing a huge sustainability opportunity. The Water LA Program is spearheaded by The River Project and the Water LA Collaborative is in development with various partners to bring exponential progress to the program. We are currently working to implement Water LA retrofits in the County unincorporated neighborhoods of Altadena, Bassett, Florence-Firestone, and West Whittier-Los Nietos.